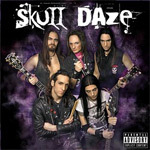 Formed in the summer of 2007, Skull Daze is another Italian band reviving the 80's glam hard rock and metal sound. However, it takes a lot more than girly makeup, torn jeans and leather, and a foul mouth to be the real deal. If you want to revive and reinvent those glory days you need strong musicianship and songs. Those songs need a brisk driving pace, a strong sense of melody and big hooks, big vocal arrangements with catchy choruses and, finally, some ripping guitar work. Luckily for us, Skull Daze has the talent to pull it off, with better than average results. Name your favorite glam band heroes from the 80's and you will probably hear them in Skull Daze's style. I hear more RATT with some Dokken and Crue for weight. Overall, Skull Daze has a more forceful metal edge in their music, as opposed to strict melodic rock. Numbers like Heartbreak City, Turn It Down, and Beware have the swagger of rock, but fierceness of heavy metal. Additional positives include the slick fret work and big vocal harmonies as heard on Dirty Girl and Nowhere to Run. Conversely, Skull Daze's vulgarity gets old after awhile (it seems they're generally pissed at past, present, and future girlfriends). Also, while on the whole this is a very strong debut, I found Back to Hell and Heartless Love to be dodgy and mundane songs. Nevertheless, on this full-length debut, Skull Daze nails the fiercer side of 80's glam rock by giving it a sure metal edge. Strong musicianship and song composition make this work a creative and urgent offering, and less a derivative homage to the past. Very recommended! On their full-length debut, Skull Daze nails the fiercer side of 80's glam rock by giving it a sure metal edge. Strong musicianship and song composition make this work a creative and urgent offering, and less a derivative homage to the past.